Gloria E. Anzaldúa was a scholar of Chicana cultural theory, feminist theory, and queer theory. She loosely based her best-known book, Borderlands/La Frontera: The New Mestiza, on her life growing up on the Mexican-Texas border and incorporated her lifelong feelings of social and cultural marginalization into her work. When she was eleven, her family relocated to Hargill, Texas. Despite feeling discriminated against as a sixth-generation Tejana and as a female, and despite the death of her father from a car accident when she was fourteen, Anzaldúa still obtained her college education. In 1968, she received a B.A. in English, Art, and Secondary Education from Pan American University, and an M.A. 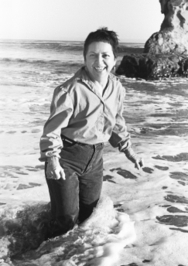 in English and Education from the University of Gloria E. Anzaldúa was a scholar of Chicana cultural theory, feminist theory, and queer theory. She loosely based her best-known book, Borderlands/La Frontera: The New Mestiza, on her life growing up on the Mexican-Texas border and incorporated her lifelong feelings of social and cultural marginalization into her work. When she was eleven, her family relocated to Hargill, Texas. Despite feeling discriminated against as a sixth-generation Tejana and as a female, and despite the death of her father from a car accident when she was fourteen, Anzaldúa still obtained her college education. In 1968, she received a B.A. in English, Art, and Secondary Education from Pan American University, and an M.A. in English and Education from the University of Texas at Austin. While in Austin, she joined politically active cultural poets and radical dramatists such as Ricardo Sanchez, and Hedwig Gorski. After obtaining a Bachelor of Arts in English from the then Pan American University (now University of Texas-Pan American), Anzaldúa worked as a preschool and special education teacher. In 1977, she moved to California, where she supported herself through her writing, lectures, and occasional teaching stints about feminism, Chicano studies, and creative writing at San Francisco State University, the University of California, Santa Cruz, and Florida Atlantic University, among other universities. Which book would you like to select as a group read for the Social Change & Activism Goodreads Group for June/July 2011?